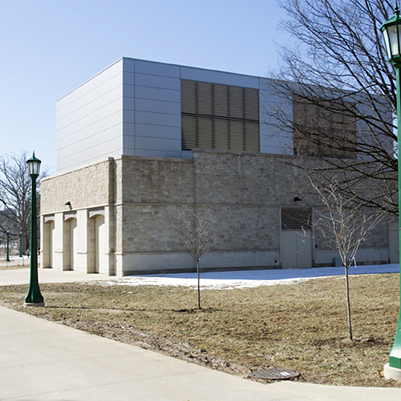 A new chilled water plant was constructed south of Stempel Hall on the IU Bloomington campus. Incorporated with the layout of the Ashton Student Housing project, this facility was designed to generate 1,500 tons of cooling, provide space for an additional 750 tons, and produce chilled water for the new Ashton Student Housing buildings. Two cooling towers are located on the roof, with space for an extra tower. A high voltage substation located in a separate electrical room inside the building provides power to the facility.